The right learning environment is as important as the training itself. That's why you'll find our facilities and training equipment are as professional and inspiring as our staff. We understand how important it is to learn on the same type of machine you're likely to use when you leave. All computer systems are Internet-ready, and feature the most widely used versions of relevant software. Our hardware and software is reliable and up-to-date, incorporating the most relevant technology available. 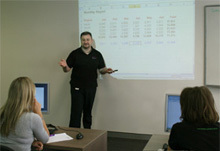 Dynamic Web Training locations in Sydney, Melbourne, Brisbane, Canberra and Adelaide are located close to public transport and car-parking options. Our central locations make training easy and efficient for you. If you’re too far away from one of our locations or have specific training needs, Dynamic Web Training can provide customised on-site training services. When you’re exploring new concepts and developing professional skills, a well-designed physical environment is essential. 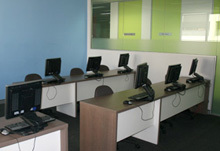 Dynamic Web Training provides spacious, well-lit classrooms that are optimised for effective learning. At Dynamic Web Training, our sessions are focussed on the job at hand. We ensure that participants are able to feed their bodies as well as their minds, so that they can sustain energy and concentration for the whole journey. Our training facilities are centrally located – perfect for a lunchtime stroll to one of many nearby eateries. And to keep your energy levels up, we offer complimentary tea, coffee and cold drinks throughout the day. Search for a course by location or contact us to discuss your software training needs.